Sunrise at Smailholm last week, looking towards the Cheviots, by Liam Thomson. WHY DO YOU STAY HERE, MR WEST? As a reader of letters pages for many years, I struggle to remember a contribution as blatantly vindictive as the one penned by Richard West (Southern Reporter, January 31). As usual he expresses his wishlist of everything humanly possible he hopes will befall Brexit – the only thing he ommited was the plague, possibly worrying that it might spread up here. This has traditionally been his mindset, so this doom-laden prophecy was not new or unexpected. But he bizarrely then states he will look on with considerable pleasure as England, which is supposedly the laughing stock of Europe, races back to the Stone Age. His final thought is that by then Scotland must be well out from under – in other words independent, his dream scenario. What alternative planet does this man inhabit? Is he so eaten up with hatred of the folk over the border that he can’t see that if Brexit is such a mitigated failure, it would have a huge impact on the Scottish economy, even if by some miracle independence and entry to the EU was achieved overnight? The most likely outcome is that Scotland would still be part of the UK, and if the English did suffer all the misfortune he wishes on them, the Barnett Formula, which subsidisies the SNP’s vote-winning giveaways, would be drastically reduced, hardly beneficial to our interests. The Borders has traditionally been a stronghold of remaining in the UK, because obviously we would be affected most in our daily lives by any border regulations imposed. So why does Mr West choose to reside here? He would probably wish to avoid entering enemy territory by visiting Berwick, may I suggest he relocates to an independence stronghold where his rhetoric will be greatly appreciated. This would leave normal, logically-thinking folk to hope that Brexit is a huge success and the whole of the UK shares in its benefits. Remember the Millennium Bug or Y2K? Computers would not recognise the digits 00 as the year changed from 1999 to 2000, experts said. The media was full of alarmism about planes crashing, power plants shutting down and even nuclear missiles being fired off at random. We were told people would die as a result of a shortage of medicine. On the last day of 1999 there were long queues across the globe at cash machines as people emptied their current accounts before the fatal hour. In the event, nothing happened. Ditto Brexit. Experts have fought each other to get the most scary story into the press. The prize for the most alarmist must surely go to Imperial College London which reported that thousands will die after Brexit as people will not be able to afford their five a day. In May 2016, HM Treasury published a report entitled ‘The immediate economic impact of leaving the EU’. In it the Treasury said that under its “shock scenario”, a vote to leave would result in an immediate recession, 3.6% lower GDP within two years and unemployment up “by around 500,000”. In its “severe shock scenario”, after two years GDP would be 6% lower and unemployment would increase “by around 800,000” if the populace had the temerity to vote leave and panic their masters in Brussels. In the event none of these things happened. The predictions were completely untrue. The economy continued to grow with record inward investment. Unemployment fell to a record low. Wages are rising faster than prices. Exports are at a record high. Forbes placed Britain as the best country to do business for two years in a row. The 2019 Audit of Geopolitical Capability places the UK second in world rankings, after the USA. Wildly-exaggerated predictions about a “no deal” exit should be dismissed out of hand. Think of the advantages of a World Trade Organisation (WTO) exit. First we are free of EU rules permanently. The backstop has gone. Northern Ireland continues to be in alignment with rest of the UK. Trade deals can be signed in short order. Economists for Free Trade expect GDP would receive a 7% boost of £135bn. We save another £39bn immediately – promised to the EU in the Withdrawal Agreement which would be shredded. Uncertainty is ended, not dragging on for years. The Common Agricultural Policy (CAP) and Common Fisheries Policy (CFP) no longer apply – the UK government can support farmers and fishermen in the best way possible. And EU-UK trade would continue as before, not least because the EU sells us £90bn more than we buy from them. That is why the head of Calais port has guaranteed that trade will be unrestricted. The real scare story is that the EU elite is scared of a WTO deal, because it would place the UK in a position of great advantage over the sclerotic organisation. We would be out – and really have taken back control. The SNP’s leader at Westminster, Ian Blackford, loves to portray Scotland as being sidelined in that parliament. Yet it is the SNP, not Scotland, that is being sidelined, and this is self-inflicted by the nationalists’ insistence that every issue must be linked to the ambition that transcends all else for them, namely independence. Neither the UK government or any of the opposition parties can trust a party that relentlessly pursues the break-up of the UK, so invariably the SNP is left with few friends in Westminster. Meanwhile, Mr Blackford and his SNP colleagues continue to use inflammatory and exaggerated language to stir grievance, which in the case of the Irish border is a deplorable tactic – he claimed in the latest Brexit debate that the Good Friday Agreement has been “ripped apart”. The delicate and relative peace that has existed in Northern Ireland over the 20 years since the agreement was signed should not be threatened by the antics of Scotland’s separatists. With his regular outbursts of unsubtle and staged outrage, Mr Blackford merely proves time and again that as the SNP has no intention of playing a constructive part at Westminster, the party prefer to render itself irrelevant by its own constant negativity. In reply to Eric Falconer’s letter published last week, I seem to recall that the 2016 EU referendum was a nation-wide vote and not just limited to Scotland. It was unfortunate that the result did not go my way (or yours), but as we live in a democracy we have to adhere to the decision. I agree with you that this will affect all of us, so I suggest you accept this nation-wide decision and get on with your life as best as you can. There are some facts that Conservative MSP Rachael Hamilton forgot to mention in her column entitled ‘Taking the Greens to task over property tax’ (Southern, January 24). Such as the four occasions when her party shored up the SNP budget. She also didn’t mention that the Tories are complemented by 24 regionally-elected MSPs and the Labour party by 21 – somewhat more than the Greens’ six that she so denigrates. Mrs Hamilton is correct to say that the Scottish Greens want more local democracy and better funding for councils, although she has forgotten that the agreement between the Holyrood government and Greens last year released an extra £160m for Scottish local authorities. She may have misheard, but the Scottish Greens want councils to make any local tourist taxation decision. They also want the government to set up talks to discuss reviewing and reforming the outdated council tax. Any talk of “damaging taxes” is just scaremongering. Cooperation, between all parties, is what Scotland needs in order to thrive, not confrontation and petty political soundbites. If only MP John Lamont’s actions matched his words. “As part of the UK, Scotland always enjoys the best of both worlds – with a strong Scottish parliament with the guarantee of more powers, backed up by the strength, security and stability of belonging to the UK. In 2017, Mr Lamont voted against the transfer of more powers to Holyrood. He voted against Westminster not being allowed to ‘grab’ powers previously held by the Scottish parliament. He voted against UK membership of the EU, against maintaining the existing rights of UK nationals living in the EU. He also voted against an energy price cap, increased funding of public services, restoring nurses bursaries, ending the public sector pay cap, increasing the minimum wage and laws to promote equality and human rights. This is but a partial list and only refers to 2017. Whatever your political persuasion, some of the above policies will affect you or your family one way or another. For example, by voting against more powers for the Scottish parliament meant the SNP could not increase pensions as that is still a power reserved to the Department of Work and Pensions in London. The potential Borders rail link between Galashiels and the west coast is causing huge concern because, once again, the forgotten east coast of Berwickshire is footing the bill for central Borders vanity projects. While council ward 7 (east Berwickshire) seems left behind, those in Galashiels and the rest of the central Borders appear to have multiple millions spent on them. With the purchase of the estate neighbouring the existing railway facilities for a large, undisclosed sum, which includes an unlisted mansion house, it looks like this project will go ahead. Support for central Borders projects seems relentless. Why do we not have a louder voice to represent the views of residents in ward 7? We have three elected members and have not heard a single outcry. We need properly-maintained roads before railways that will give us nothing in return. These projects detract from our area and take from the table of hard-working families who now face a 3% increase in council tax for less services. There is no equality between areas in the Borders. We have limited public transport after council cuts to support for bus companies. The local authority has no money to support what exists, but can find millions for trains and tapestries. 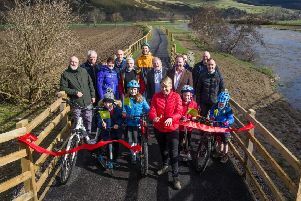 We have roads turning to gravel with craters along the edges because of cutbacks, but can afford country estates and multi-million-pound projects in the central Borders. We are left out, left behind and under-represented. Nobody has stood up and said enough is enough. But it’s time someone did. Border Ecosse Car Club is planning a Scottish Borders motorsport exhibition to be held during late spring/early summer. We are seeking all types of motorsport memorabilia, from the very early days of motorsport up to the present day. We know motorsport was active before the First World War, however, there was quite a gap after that conflict before restarting. If anyone has photos etc. from Charterhall, Winfield or Stobbs, that would be great. Rallying memorabilia, past and present, would also be most welcome, as would anyone bringing along historic racing cars, rally cars, motorcycles, karts etc. to display at the exhibition. If anyone can help, could they please contact me. Sir, – Thank you so much for all the support that your readers are giving by sending as many stamps as they can for Bone Cancer Research Trust. In 2018 we raised £12,775 and in 2019 we are aiming for £25,000! Please ask everyone you know to support our appeal! Every stamp, collection, first day covers and so on sent to us will help raise vital funds. On Facebook? Join our group for regular updates – BCRT stamp appeal volunteers & collectors. My news years resolution is to get a supporter in every country in the world, can you help with that challenge? Every 10 minutes somewhere a child, teenager or adult is diagnosed with primary bone cancer. Each year since the charity started we have endeavoured to grow our research to save lives. Over the last three years we have encouraged more researchers to explore primary bone cancer. Stamps can be sent directly to me or if trimmed up to 1cm of paper around the stamp and sorted into UK, Pre-decimal or overseas the stamps can be sent directly to our buyer at BCRT, PO Box 6198, Leighton Buzzard, LU7 9XT, where we raise 25% more! Please send horizon labels to me.